Gurgaon/ Delhi NCR, January 01, 2019. India domestic IT spending is estimated to grow at 11.9% in 2019 and reach a size of INR 259,762 Crores. The spending grew at 11.5% in 2018 as against a start-of-year prediction of 11.6%. 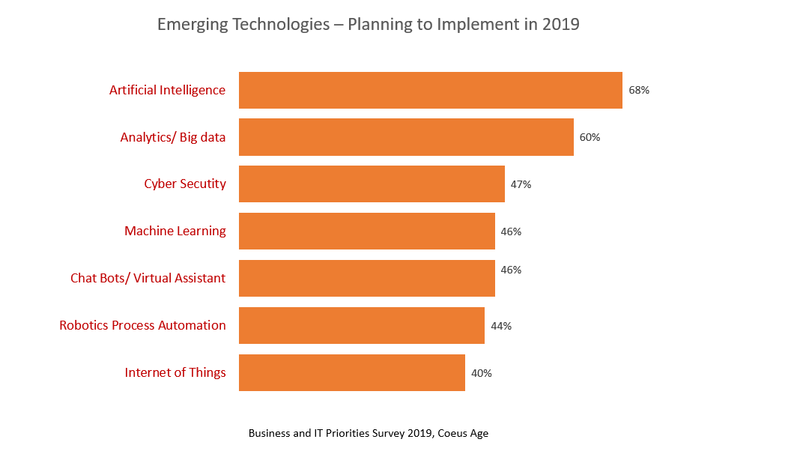 This was revealed by Coeus Age, a fast-growing research organization, in its annual research report India Business and IT Priorities 2019. The research report is based upon inputs of 108 CIOs/ IT Heads of very large, large and medium sized Indian enterprises. Inputs were sought regarding their business priorities and IT plans for 2019. 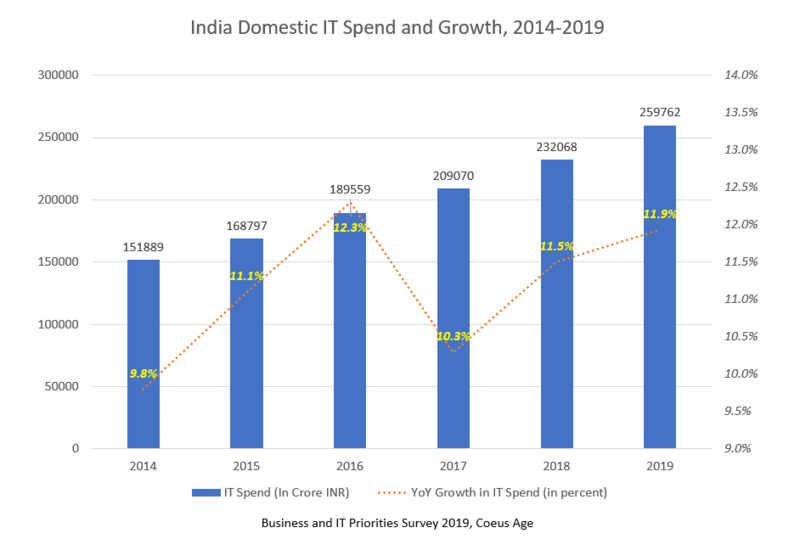 ‘After an aberration in 2017 due to the disruption caused by the structural changes undertaken in the form of demonetization and GST roll out, the IT spend growth bounced back in 2018. This is on the back of a revival of the Indian economy, which is expected to continue through 2019, translating into a growth of 11.9% in the IT spend’, commented Dr. Kapil Dev Singh, CEO, Coeus Age. The report reveals that the growth is catalysed by enterprise and government spending on digital and consumer spending on smartphones and digital services. In 2018 digital spend by enterprise and government segments put together, grew by 27.5% over 2017, accounting for 25.2% of their overall IT spend. The proportion of spend on digital is estimated to grow to almost 30% in 2019, implying a growth of 29% over 2018. The commoditized traditional hardware and software products (PC, Server, Storage, Networking, and In-premise Enterprise Software) spend is estimated to grow at slightly below 4%. There is also an expressed interest by the enterprises towards exploring the latest digital technologies like Artificial Intelligence (68%), big data analytics (60%), machine learning (46%), and Internet of Things (40%). ‘We had predicted that the second wave of digital represented by the likes of AI, ML, RPA and IOT would gain traction in 2018 and shall become mainstream in 2019. That is becoming a reality as the interest of the enterprise and government customers is converting into ‘on the ground’ concrete projects. This is evident in many industry verticals such as BFSI, Automobile, Healthcare, Infrastructure, Utilities, Oil & Gas etc.’ commented Dr. Kapil Dev Singh. For press enquiries contact Dr. Kapil Dev Singh at +91-9811771187 or mail at kds@kdsnext.com. Coeus (Koios) was the Greek Titan of intelligence, the axis around which the heavens revolved. In the current age, enterprise intelligence is the axis around which organizing takes place, a true source of strategic advantage and success. Coeus Age is a fast-growing research and consulting organization that is continuously developing actionable insights for the business and government leaders build value amid digital disruption. Gurgaon/ Delhi NCR, December 29, 2016. India domestic IT spending is estimated to grow at 12.9% in 2017 and reach a size of INR 2,14,012 Crores. The spending grew at 12.3% in 2016 as against a start of year prediction of 13.5%. This was revealed by Coeus Age Consulting in its annual research report Enterprise Business Priorities and IT Plans, India, 2017. The research report is based on inputs from 100 + CIOs/ IT Heads of very large, large and medium sized Indian enterprises regarding their business priorities and IT plans for 2017. ‘The domestic IT spend has been gradually picking up since its lowest in 2013. This is supported by the emerging strength of fundamentals in the Indian economy, despite the global challenges. With the new tax regime becoming a reality and a massive push by the government on digital, the growth shall pick pace by 2018’, commented Dr. Kapil Dev Singh, Founder and CEO, Coeus Age Consulting. The performance in 2016 has been below the estimates given the delays in GST implementation and passing of other key economic legislations. The stage now seems to be set for their implementation and emergence of a supportive business environment. The passing of Aadhaar Act, 2016 to spur eGovernance initiatives and the massive push by the government on digital economy, the IT and digital spend will receive a major boost in 2017 and beyond. The spending on digital (SMAC+) (by the enterprise and government sectors) will grow at 43% to touch 38, 522 INR Crores in 2017. This will be 18% of the overall IT spend. The study also revealed that 67% of the responding CIOs see digital technologies as one of the top 2 IT priorities for 2017, up from 53% in 2016 and 40 % in 2015. This is further complimented by 33% and 26% of the CIOs putting architectural or applications overhaul respectively as one of the two priorities for 2017. It shows that majority of CIOs are planning to upgrade their underlying infrastructure and applications for allowing a deeper play of the digital technologies in 2017. 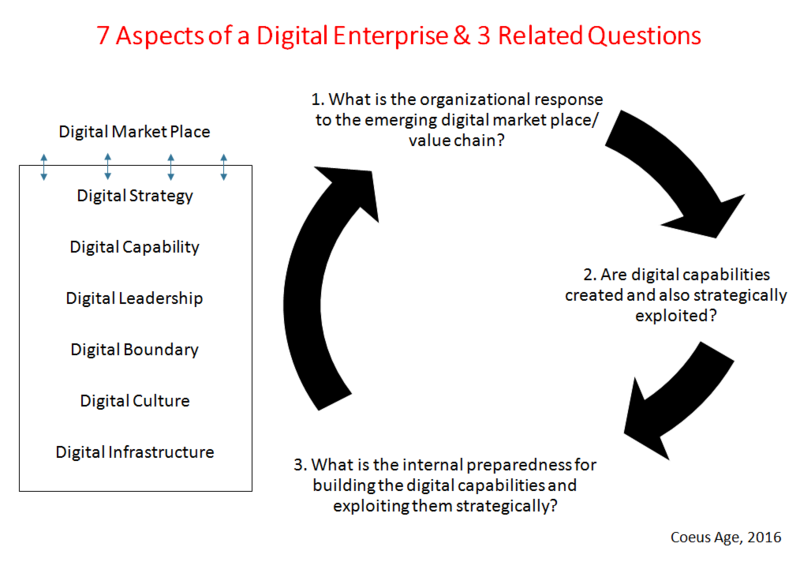 ‘The initial flirting with digital technologies in a piecemeal manner is giving way to serious building of digital and converging it with the underlying IT infrastructure and applications. The transformation journey for many Indian enterprises shall begin in 2017, which shall spread to become main stream in the coming years. Today, the boards of many enterprises are asking difficult questions and their CEOs are very seriously contemplating as to how digital can be leveraged to build value’, commented Dr. Kapil Dev Singh. For inquiries contact Dr. Kapil Dev Singh at +91-9811771187 or mail him at kds@kdsnext.com. Coeus Age Consulting is a next-generation knowledge domain service provider. Coeus Age Consulting intends to bring the latest thinking in the field of leadership, strategic management, economics, process management, information management, and organizational development to enterprises; and enable them to build business value from IT and digital.